Compared to other high performance cards, the GTX 260 is a little plain. Where's all the heatsink pipes? You should be aware by now that there are two versions of the GeForce GTX 260 kicking around, with little to differentiate them from each other in terms of nomenclature. For some reason this one has to be called the 'GTX 260 OC'. The original, which was long phased out but still on sale in some quarters, has just 192 stream shaders in its core, the later revision enabled another quad and took that total to 216. Otherwise, they're more or less the same GPU. The performance difference is considerable, though, so do avoid the earlier model if you can. Needless to say, this is one of the more powerful cards. Build-wise, the 260 is the same size as the 275, which is just another way of saying 'gigantic'. It's certainly big enough that it's worth making sure your case and motherboard can accommodate its 26cm length without interfering with SATA ports or internal struts, as has been known to happen in the past. It's not a noisy card though, and the huge heatsink does a good job of dissipating heat without too much fuss. When it comes to the benchmarks, the 260 fits neatly into the very small gap between the 1GB Radeon HD4870 and the Radeon HD4890. It runs away with both AMD cards in some tests, and is the worst of the three in others. Unless you have a predilection for either vendor, you're going to be happy with any one of these cards running at high res and image settings. 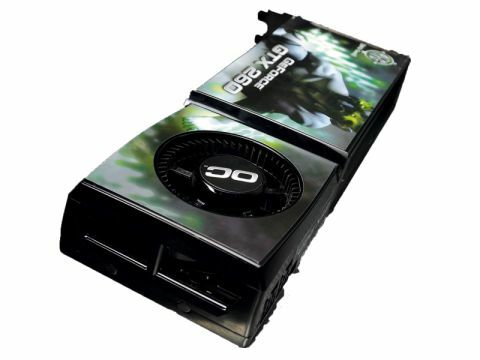 And given that the price of this is identical to the Toxic HD4870, it comes down to superficial preferences. We're opting for the Sapphire card purely because it looks better, but the choice is yours.